For many this marked the first week back to school. For retired teachers, this week emphasizes our freedom from alarm clocks and school calendars. When I met a friend for lunch who just retired after 40+ years of teaching, we celebrated our mutual freedom from meetings and preparing bulletin boards. Transitions were also on the conversational menu. Like me, she is a mom to three children and grandmother to two. Unlike me, she is widowed and her grandchildren live out of town. I asked if she was thinking of moving to be near her children and grandchildren in Chicago. Her answer surprised me. "I'm waiting for my sister to decide where she's retiring in Chicago.I want to live close to her." "Not next door to your grandchildren?" I thought.Reconsidering, I thought how living near your sister makes perfect sense. Leslie and I have good role models for sister-roommates. When our grandfather died suddenly, our grandmother moved to a condo in Florida and her single sister from New York City joined her.They were an odd couple often rivaling Felix and Oscar in the humor department. They shared warmth and love for each other. Their apartment became a social center for other retirees with our grandmother making sure every occasion in the complex was celebrated with her baked goods and her sister vowing daily to go on a diet after each celebration. They also argued regularly about trivia like whether Aunt Gertie remembered her Russian and they argued about weighty matters like when should the other call an ambulance.They each believed they were caring for the other and yet life with them was always a party. When our grandmother died, her sister moved to live near their youngest sister in Virginia. You may remember from Jewish Luck that although Vera and Alla are not sisters by birth, they dubbed themselves sister-friends within twenty-four hours of meeting each other in the registration line at the Leningrad Institute of Finance and Economic.Their embrace of the term acknowledged their parents' university connections, but the term proved prophetic. Like most sisters, their closeness was unparalleled and their misunderstandings and their four year long estrangement left them both with a profound sadness that sat like a stone in their gut. With Vera retired from her business and Alla planning ahead for her post work life, the two women have bought apartments just blocks from each other in Tel Aviv. Their sister-friendship will continue, but this time to the sound of the Mediterranean rather than the lapping of the Neva's waters against the banks of St. Petersburg's canals. Leslie and I are not planning to move in together even though I've had the dream of sharing a home like the Riordan Mansion in Flagstaff with Leslie and her husband living in one wing and my husband and I in another.The two halves of the craft-style mansion are linked by a "rendezvous room. "Perfect—separate kitchens but a place to convene. I think we'd scale back on the 40,000 square feet, though. Our many travels over the past few years reminded us that despite our different characteristics (e.g. morning lark vs. night owl), we love being together and every experience is enhanced by sharing our unique perspectives and common roots. 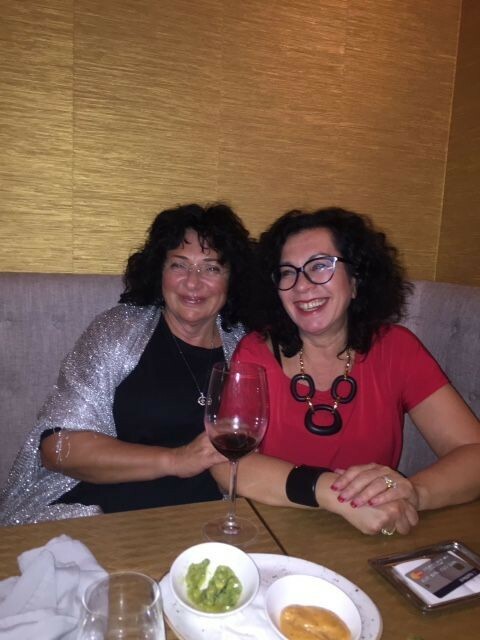 Our trip to St. Petersburg and Stockholm researching Jewish Luck was the first time I could imagine us as oldster roommates and two subsequent trips to Israel together emboldened me to believe that like Vera and Alla we will always be each other as sister-friends. I wish we could chat with Grandma Rae and Aunt Gertie about their life together. I believe they accepted that their sister roommate situation was finite, but while they were together, life was a party to be celebrated.